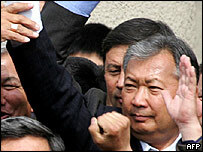 Kyrgyzstan will hold fresh elections in June, says the central Asian republic's acting president Kurmanbek Bakiev. The pledge came a day after opposition protesters stormed parliament, ending the 15-year rule of Askar Akayev. Mr Bakiev told a crowd in the capital Bishkek that parliament had picked him as president and prime minister. Russia's President Vladimir Putin has criticised the "illegal" overthrow and offered asylum to Mr Akayev, whose whereabouts remain a mystery. However, Mr Putin said he was willing to co-operate with the new leadership in Bishkek. The sudden overthrow of Mr Akayev, a Russian ally, appears have caught the Kremlin off-guard, says BBC Moscow correspondent Damian Grammaticas. 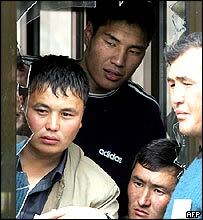 Unconfirmed reports say Mr Akayev fled to Kazakhstan after being overthrown on Thursday. The acting president told parliament "elections must take place within three months" under the existing constitution. However, he did not set a date for the vote. He named a popular opposition leader, Felix Kulov, as the person responsible for restoring order and security in the country, following a night of unrest. Opposition leaders are meeting to decide a new cabinet. They have appealed for police to return to work after the chaos of Thursday. Three people were reported to have been killed overnight, as looting swept the city and buildings were burnt down. Ishenbai Kadyrbekov was elected as the opposition's new speaker, although the upper house of parliament had initially said he would be the new interim president. Mr Akayev's administration was swept from power on Thursday, when thousands of anti-government demonstrators chanting "Down with the Akayev clans" gathered in Bishkek and stormed the presidential palace. The huge protests were sparked by elections last month, which were widely seen as fraudulent. But many other people joined in, motivated by anger about poverty, unemployment and official corruption, correspondents say. Baktybek Abrissaev, Kyrgyzstan's ambassador to the US, described the takeover as an illegal act. Mr Akayev, he said, was "the legitimate leader of the country" who knew that "the constitution, the law, is behind him". Moscow controlled Kyrgyzstan in the former Soviet Union and still maintains a military base in the area, as does the United States.